Original creations for some of life's most joyous moments! A picture is worth a thousand words, but no picture can capture the timeless elegance of Originals by Stephanie. Featuring harmonious compositions and loving attention to detail, Stephanie's creations add a special touch to weddings or baptisms that are rich in the traditions and rituals of the Greek Orthodox Church. Originals by Stephanie are unique! New designs are always being introduced, as other models are retired. To check current availability, to obtain additional photos of preferred items, or to schedule an appointment, please email stephanie@stefana.us. Stefana (wedding crowns) are symbols of the glory and honor that God bestows upon a couple during the Sacrament of Holy Matrimony. 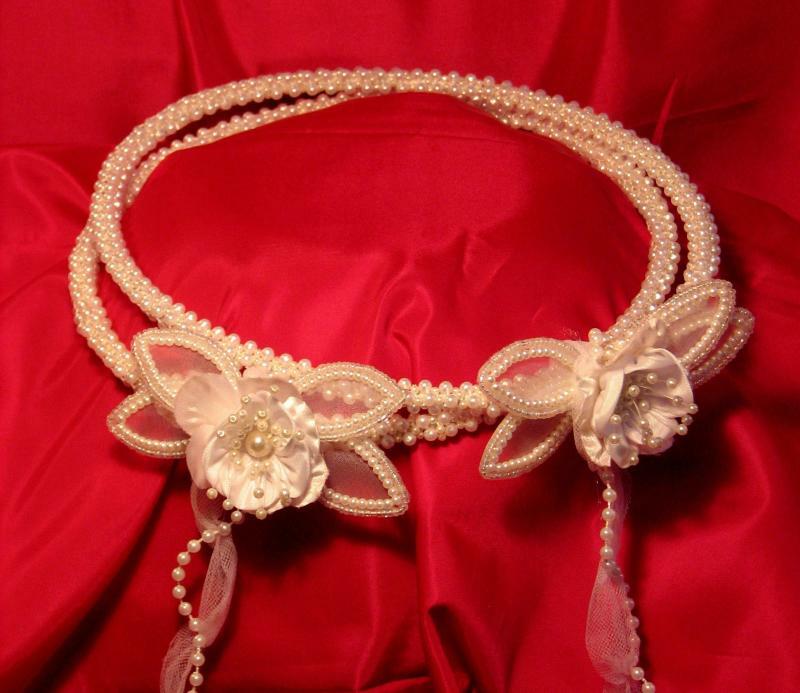 The wedding crowns are joined by a ribbon which symbolizes the unity of the couple. Each pair of stefana from Originals by Stephanie requires hours of meticulous work to complete. 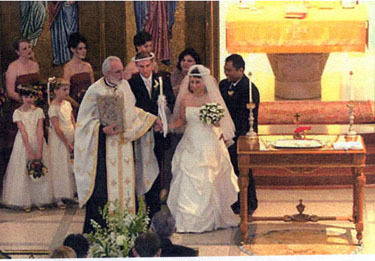 The stefana are joined by a generous 5- to 6- foot long ribbon so that the bride and groom can move easily on their Ceremonial Walk as a newly married couple. 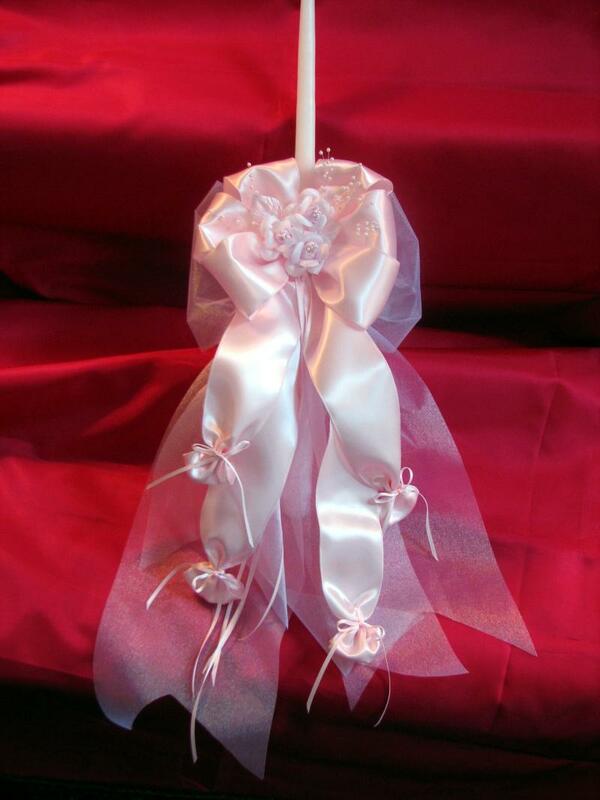 Included with the set are two coordinating candles for the bride and groom. Stefana sets are priced from $135 - $295, and are all one-of-a-kind! The Baptismal candle symbolizes a child's attachment to Christ, the Light of the world, through the Sacrament of Holy Baptism. Baptismal candles from Originals by Stephanie come in two lengths, both of which give ample burning time for the baptismal ceremony and for the subsequent visits to church for the baby's communion. Candles in the 17-18 inch length are priced at $69; those in the 23-24 inch length are $89.